The Introduction by Richard Grimes describes the chapter in the following terms: Chapter 11 looks at the overtly vocational context of professional legal education in Hong Kong. Chow suggests that when ranking learning experiences in terms of purposeful experience, a synonym of 'doing the real thing' occupies the most privileged position in that structure, followed by contrived experiences that are synonymous to simulations. Both require the learner to apply principle to practice, either in real life or through simulated exercises. This, he says, is echoed by a range of reports that together criticize legal education for typically paying limited attention to the needs of professional practice, resulting in habits of thinking like a student rather than an apprentice practitioner and conveying the impression that lawyers are more likely to be seen as scholars than legal practitioners engaged with the problems of client. Chow notes that 2012 marked the fortieth anniversary of professional legal education in Hong Kong. Prompted by a comprehensive review on legal education, the curriculum, in terms of content and delivery, underwent major reform in 2008, but a survey carried out a year later revealed that in general, students still encountered difficulties in making the transition from the undergraduate to the professional stage of study. Specifically, students found it hard to practically apply the legal knowledge which they had learnt from their undergraduate studies to address and solve legal problems. In Chow's view, they needed to undergo a change in mindset from studying the law to applying it in practice. 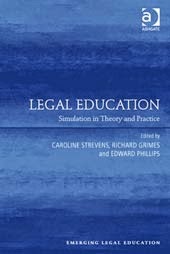 Hence, at one institution, in order to make the programme more akin to real-life legal practice, a team of teachers and supporting staff decided to pilot a model comprising two new approaches to learning and teaching: (a) the use of the Simulated Professional Learning Environment (SIMPLE), a transactional e-learning platform; and (b) the use of 'standardized clients' who the students could 'represent'. This chapter traces the evolution of a particular vocational programme: from a content-rich curriculum to one with increasing emphasis on transactional knowledge and lawyering skills; from the use of discrete hypotheticals to files adapted from real cases. Chow then explains the circumstances leading to the pilot initiatives. The chapter describes the objectives and expected outcomes of the pilot test, how it will run and what is being done. The chapter is particularly valuable in that it is able to take a look back at the reasons for change and to reflect not only on the impact of alternatives to methodologies but also how this has informed more recent developments. Wilson Chow is currently the Head of the Department of Professional Legal Education in the Faculty of Law.